Colossal might look like a monster movie. Indeed, it may feature a Godzilla-like giant lizard leveling a major city in the Far East but, in many ways, that’s just window dressing. Allegorical in the extreme, Colossal is really a drama about one woman’s struggles to overcome twin demons: her alcoholism and the pernicious influence of an abusive, controlling man. The struggle between Gloria (Anne Hathaway) and Oscar (Jason Sudeikis) is played out not only in a small New England town but on the streets of Seoul, South Korea, where a giant lizard dukes it out against a massive robot with the whole world watching. Colossal is 2/3 of a great movie and 1/3 of a mess. Writer/director Nacho Vigalondo is tremendous when it comes to setup and the majority of his narrative but he can’t stick the ending. In trying to be too clever, he falls afoul of one of the basic tenets of storytelling. When working in a fantasy or sci-fi milieu, it’s possible to do any number of magical and strange things with one proviso: internal consistency must be maintained. Or, to put it another way, whatever rules are established for this universe have to be adhered to. That’s where Vigalondo fails. After establishing in meticulous detail the governing principles for how, where, and why the monster and robot appear, he violates them in the third act in order to facilitate a “cool” resolution. To an extent, this could be considered a “refrigerator” scene (it works in the moment but falls apart when you think about it afterward) but it’s a glaring weakness in an otherwise strong motion picture. Following a prologue that feels like an excerpt from a 1970s-era Godzilla movie, the action shifts to New York City, where Gloria comes home after an all-night drinking binge. Her boyfriend, Tim (Dan Stevens), fed up with her unwillingness to confront and correct her problem, kicks her out of their apartment. Left with nowhere to live and not having a job to rely on for income, she returns home to the small New England town where she grew up. There she meets an old school friend, Oliver, and they renew their acquaintanceship. Oliver is initially cordial and helpful. He offers Gloria a job at his bar, which she accepts. Unfortunately, this leads to bouts of all-night drinking with Oliver and his buddies, Garth (Tim Blake Nelson) and Joel (Austin Stowell). She experiences blackouts and wakes up on a bench near a children’s playground. Meanwhile, halfway around the world, in Seoul, the giant lizard crashes through the city at precisely the same time that Gloria walks across the playground. Eventually, by seeing TV images of how the creature’s mannerisms and actions mimic her own, Gloria suspects a connection. She runs a test that proves the city-stomping monster is her manifestation and she can control its actions. She also learns that a similarly fearsome giant robot is a representation of Oliver, who uses Gloria’s guilt about killing people as a tool for manipulation and blackmail. Although aspects of Colossal can be seen as homages to the Japanese monster movies of the 1950s and 1960s (which have also influenced Pacific Rim and its sequel as well as a host of new Godzilla-influenced creature features), the film is more interested in the smaller, human story in New England than what’s happening in South Korea. This focus may provoke disappointment for some die-hard monster movie fans; it isn’t Cloverfield. Although the special effects are solid and there are scenes of mayhem and destruction, they aren’t the point. It’s a little like comparing Gareth Edwards’ Monsters to his subsequent Godzilla reboot. Colossal expects viewers to accept the link between Gloria and the giant lizard. It’s built into the movie’s DNA and, as such, is no more outlandish than buying into the concepts of flying spaceships or wizards in other genre films. A half-explanation is provided for the connection but it’s no more detailed than it needs to be and doesn’t go so far that we question its practicality (at least not too much). Accepting the premise allows us to believe its consequences for Gloria, and that’s where the meat of the movie emerges. She stops drinking when she realizes that her drunkenness isn’t just detrimental to her health but can result in the deaths of hundreds of innocent people. She has to cope with the reality of being a mass-murderer and is unable to accept Oliver’s shrug-it-off attitude. Then there’s her relationship with Oliver. When we first meet him, with Jason Sudeikis turning on the charm and smiling his winning smile, he comes across as meek and likeable. His attraction for Gloria is obvious and a possible romance doesn’t seem out of the question. Gradually, however, a darkness emerges. Sudeikis, who is marvelous during this transformation, shows the slow meltdown as the self-loathing, controlling personality comes to the fore. Jealousy, as Gloria hooks up with Joel, twists him and he loses it completely when Tim arrives for a possible reunion. The Oliver/Gloria connection is the perfect analog for that of a woman trapped in an abusive relationship. Oliver threatens that if Gloria doesn’t stay with him, he’ll go to the playground at the magical time of 8:05 am and have his giant robot destroy parts of Seoul – and there’s nothing her giant lizard can do to stop him. The only way he’ll refrain is if she rejects the other men and stays with him. The real monster isn’t Gloria’s 100-foot high creature in South Korea, it’s the man she’s working for in the New England hamlet. I have already mentioned the strength of Sudeikis’ performance. He’s excellent here – as good as he has been in any movie. Anne Hathaway is also strong and, although her arc isn’t as extreme as Sudeikis’, she explores a lot of emotional territory. Her expression – vacant, despairing, and lost – when she is forced to reject Tim in favor of Oliver, crystallizes her recognition of her situation. There are also moments of subtle comedy, especially during the first half, that require a deftness of touch on her part. Much of Colossal is so fresh and unique that it’s unfortunate how badly Vigalondo overreaches in the end. His solution to the dilemma, although seemingly clever on the surface, undermines a good deal of the movie’s internal logic and leaves a bad taste. 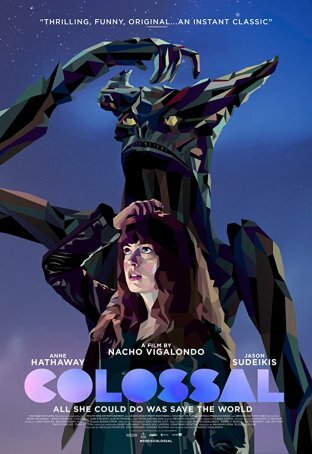 Nevertheless, issues with the final 15 minutes aside, Colossal deserves to be seen for all that’s good and original about it and for the distinctive way it uses monster movies and monster movie conventions.